Our visit was to the downtown location on Bishop street just south of Maisonneuve – dangerously close to Concordia’s downtown campus. 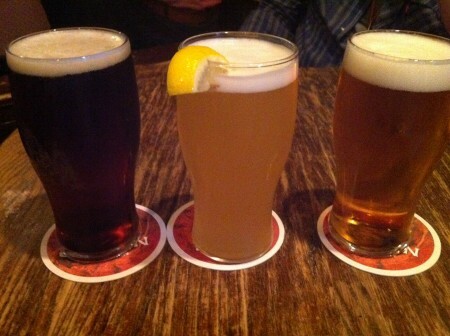 We began in the Irish manner, by ordering three pints of beer. Mckibbins boasts quite an impressive quantity of beers on tap including of course several Irish beers (Guinness, Harp, Kilkenny, Caffery’s, Murphy’s and Smithwick’s). Also on tap they offer Stella Artois, Alexander Kieth’s, Sleeman, Sapporo, Hoegaarden and Moosehead. They were all very tasty and apparently loaded with Guinness. Other notable menu items were the Irish Onion Soup which is a full crock of caramelized onions in a rich veal and Guinness broth, crowned with croutons and melted Guinness cheddar cheese. Tags: Beer, Burger, Nachos, Poutine, Pub.